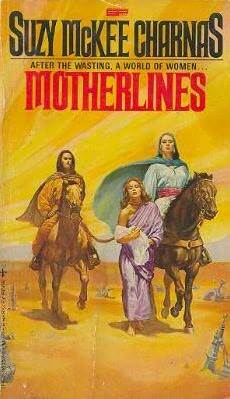 Suzy McKee Charnas’ Motherlines (1978), a novel published by Berkeley Books, is the second installment in The Holdfast Chronicles, a series that follows a ‘fem’ (women who were enslaved by men in a city called Holdfast) named Alldera, who is adopted, along with her unborn daughter, by the ‘mares’, a group of genetically modified women who separated from civilization and established a life in the desert long ago. The story revolves around the interaction between these two feminist separatist communities that were created in response to an extreme, aggressive form of patriarchy. It’s yet another utopian/dystopian/everything in between novel, but I think that it has some unique merits that bring up some new challenges to these concepts. In the story, the mares take Alldera and her baby into their unique family set-up, in which several women are responsible for raising one child. Alldera learns about the mares’ way of life (i.e. their family structures and the importance of horses ). Despite this effort, however, she never quite achieves a sense of belonging, so she leaves the mares (and her child) for a camp of other escaped Holdfaster fems like herself. Throughout the story, Alldera attempts to find niches in both societies to varying degrees of success. This book is perhaps different from other fictional accounts of feminist separatist communities in that, although both the fems and the mares consider themselves to be women, they are technically different species in that their systems of sexual reproduction are different. In fact, although it is briefly discussed, reproduction does not seem to be the primary concern for the fems, as the traditional means of reproduction would require them to interact with the men they had to escape. I think that in other stories such separatist societies have already established some alternate way to produce offspring, but this society is so new that they have to first to pursue more immediate concerns such as survival and revenge. The mares, however, do have a way to procreate. This is enough to create a great deal of animosity and xenophobia between the two groups, which was an interesting dynamic to have despite the utter absence of men. By doing this, Charnas explores some inequalities outside of the gender divide, which I think are important to keep in mind when considering feminism. I appreciated that there were inequalities and that these societies weren’t utopian– even within each of the groups there were struggles. For example, although the mares had autonomously existed in the desert long enough to have mostly forgotten about men, every one of the fems had had personal experience with being owned and abused as slaves. As an artifact of this time in their lives, the fems are inclined toward a hierarchical societal structure. They almost seem to be subservient by nature and still feel the need to please and honor those who put themselves in positions of leadership. This proves to be an inefficient system in the conditions of the desert, which probably should have been more obvious as this was the system that had already been destroying the city of Holdfast. I think that this dynamic accurately portrays the extensive damage that patriarchy can do to a woman’s confidence and self-worth. Also, I think it demonstrates how women can be unconscious enforcers of patriarchy. I think this is especially true of one character, Daya, who easily gets attached to various partners throughout the book, including one of the harsh leaders of the fem camp. On the individual level, the book deals with issues of identity. This theme creates a very rich diversity of characters. They all have distinct personal struggles. For example, although Alldera is capable of navigating both societies, neither completely accepts her. Daya tries to find self-worth outside of her former status as a ‘pet’ for the men by whom she was enslaved. Sheel, a mare who reluctantly becomes one of the mothers of Alldera’s child, questions the importance of loyalty to her family as they become more and more accepting of fems. The story is told from many of these character perspectives at different times. Although I thought it was great that the story incorporated such a large number of diverse characters, I still felt that I wanted to know more of their inner dialogues. They seemed a bit impersonal at times, and I found myself wanting the story to slow down at times so that I could better understand their thoughts and feelings surrounding their situations. Nonetheless, I would overall recommend this book. I think that longer epics with women as the main protagonists are not especially common, and the post-apocalyptic, science fiction format of this book creates a way to look at older themes such as honor and heroism through the lenses of strong female characters who have been absent in more traditional epic literature. I think that anyone who enjoys the less technology-driven settings of science fiction novels such as Dune would like this book. I would probably not, however, recommend Motherlines to readers who prefer more character-driven stories. I think this story very much focuses on the events of the larger scope of The Holdfast Chronicles, and it would have to be a lot longer to really develop the characters. Furthermore, I would be curious to see whether reading the first installment of the series would change my reading of Motherlines. I think that I would at least feel closer to Alldera, so I might suggest doing that as opposed to reading Motherlines in isolation. BONUS: Did you know that the setting of Dune was inspired by the Oregon Dunes near Florence? At least that’s what the Wikipedia page says. I’m linking this review to a blogger’s extensive and intelligent review of Suzy Mckee Charnas’s Holdfast Chronicles, comprised of Walk to the End of the World, Motherlines, The Furies, and Conqueror’s Child. I, for one, appreciate a full-series review, as it tips me off not only to which books should be read together, but also in what chronological order — a concept that can oft be obfuscated in the SF genre.